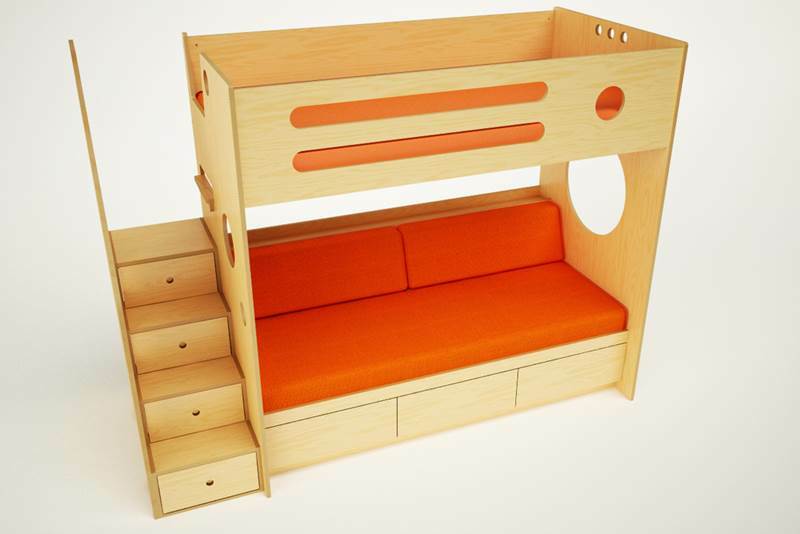 Casa Kids’ Marino Bunk set over a daybed is the ideal multipurpose, space saving solution for siblings or for kids who host frequent sleepovers. The Marino, a Casa Kids original is constructed of all-natural birch plywood certified by both the FSC (Forest Steward Council) and CARB (California Air Resources Board), formaldehyde-free glue and water-based paints and finishes. Like all Casa Kids products, this bed is super safe, equipped with enclosed rails and a top bunk that is sturdy enough to hold both parent and child. This bed also features a cool detachable hanging tray (ordered separately) that can function as a nightstand wherever needed. The daybed component works great for everyday use, for reading or resting and doubles as a place where smaller children can sleep before they transition to the top bunk, or where overnight guests can grab some shut-eye. There’s lots of extra storage included within this design, including three storage drawers and a back shelf, which is perfect for a water glass or clamp light. The Marino is available with easy to climb stairs, which double as drawers, or ladder access. Custom sizes and colors are available. Casa Kids' Marino Bunk set over a daybed is the ideal multipurpose, space saving solution for siblings or for kids who host frequent sleepovers. The Marino, a Casa Kids original is constructed of all-natural birch plywood certified by both the FSC (Forest Steward Council) and CARB (California Air Resources Board), formaldehyde-free glue and water-based paints and finishes. Like all Casa Kids products, this bed is super safe, equipped with enclosed rails and a top bunk that is sturdy enough to hold both parent and child. This bed also features a cool detachable hanging tray (ordered separately) that can function as a nightstand wherever needed. The daybed component works great for everyday use, for reading or resting and doubles as a place where smaller children can sleep before they transition to the top bunk, or where overnight guests can grab some shut-eye. There's lots of extra storage included within this design, including three storage drawers and a back shelf, which is perfect for a water glass or clamp light. The Marino is available with easy to climb stairs, which double as drawers, or ladder access. Custom sizes and colors are available.